About a year and a half ago, I began a series of articles covering how to record various string instruments. The first part covered acoustic guitar, cello, and mandolin, and the 2nd part covered ukulele, violin, double bass, I promised to post an update with photos and audio samples of different microphone techniques for harp, and this article is that update! 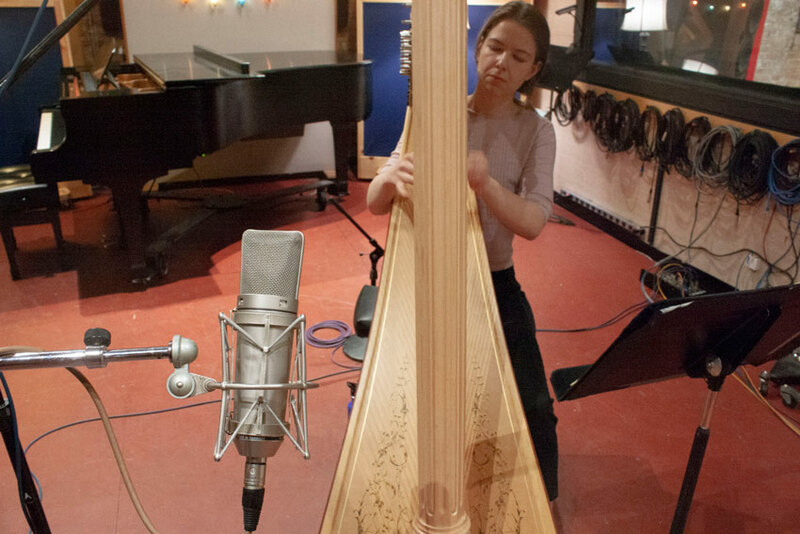 Johanna Wienholts, harpist for the Madison Symphony Orchestra, was kind enough to come to my studio for a microphone experiment. I recorded Johanna playing Une châtelaine en sa tour (Op. 110) by Gabriel Fauré. I set up several microphones to compare the most popular ways to record solo harp. 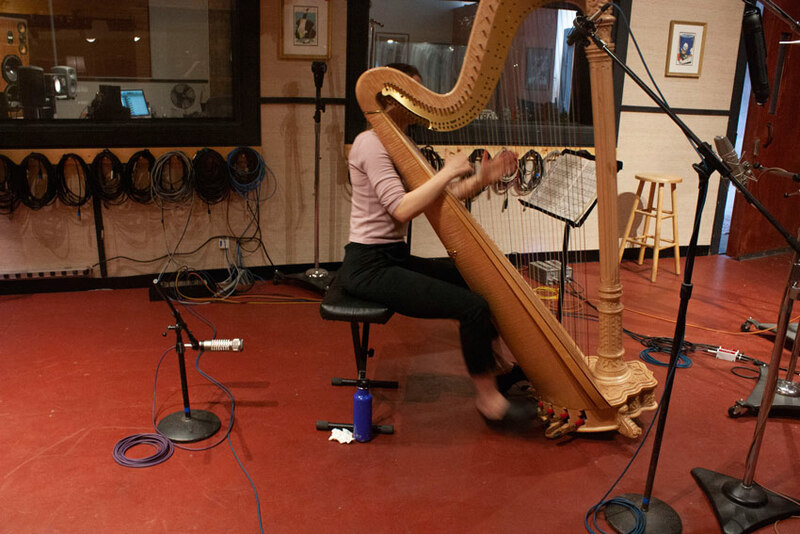 But before we dive into the set-up, let’s take a closer look at the harp. Most of the sound resonates from the soundboard and from the sound hole, which is located under the harp, opposite of the soundboard. As with any instrument that you’re new to recording, the best thing to do is to walk around the room as the musician plays so you can hear the sweet spots and how the instrument interacts with the room. For a big instrument, you need a big room. We will be working in my main tracking room which is 16’ by 14’ with 14’ ceilings. Use a large diaphragm condenser in cardioid, placed just above the soundboard. For this sample, I used a Neumann U87 Ai. My business partner and I just recorded the Wisconsin Chamber Orchestra and used an AKG 414 as a harp highlight mic and thought it sounded great as well. KM184 or other small capsule condenser placed above player pointed at the soundboard, RE27 behind the player, positioned lower to the floor, and pointed at the sound hole. Blend the two together to balance the plucking strings with resonate sound. Ribbon Mics in Blumlein - I used our trusty AEA R88 SN44 placed a couple of feet in front of Johanna, several feet off the ground, slightly angled down toward the soundboard. XY Pair - These are Peluso 2247 LEs tube mics in cardioid, placed a little further away in front of the instrument, several feet off the ground, slightly angled down toward the soundboard. Although the placement is similar to the AEA, these mics have a much brighter sound so I wanted to demonstrate both pairs. Spaced Room Mics - Earthworks QTC-40s served as our spaced pair. These are omnidirectional and were placed in a 3:1 ratio (pictured above), several feet in front of the harp, about 5 feet off the ground. All of the mics were patched into the same type of preamps - Ampria MCMAs. These were modeled after the Millennia HV-30. I chose to use the Amprias because they have a wide dynamic range and don’t add too much of their own color to the sound. The U87 is a great choice for tons of applications including harp. I thought it sounded very true to the instrument without being too boomy or “plinky.” Personally, I liked this sound better than the high/low mono set-up. The KM184 sounded good but had the potential to make the harp sound more like a toy piano depending on placement. I think it would need more compression in mixing than the U87 as well. When placing the RE27 behind Johanna, I had to make sure to not get too much pedal sound which was tricky. The AEA ribbon was a bit too dark for my taste, but would blend nicely with the U87. I noticed that the XY pair captured the attack of each note with more clarity than the spaced omnis, although the spaced omnis would be great if you’re looking for a dreamy sort of sound. It never hurts to invite the musician to listen to the recording to make sure you’re capturing their instrument the way they want it to be heard. After Johanna and I recorded a run through of the piece, I played the U87 mixed with the AEA ribbon for her. The first word she said was “gorgeous!” That’s always a good sign! You should have a clear end game in mind when planning your recording set-up when it comes to recording any instrument, but hopefully I’ve helped you to arrive at a decision faster and with more confidence when it comes to harp.